Designed by Gary Player, El Paraiso is a well-planned layout with fast greens and wide fairways bordered by palm trees and heavy rough. Streams running through the course are often hidden from sight, making course knowledge a benefit. El Paraiso presents easy walking fairways set amongst palms and pines, oleanders and olives with meandering streams and two magnificent lakes. 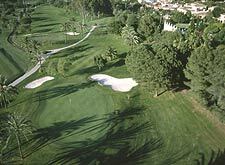 The par 71 course stretches from 4,998 for the ladies to 6,131 from the championship tees and plays host every year to the Andalucian PGA tour.